Transmedia storytelling has recently been gaining popularity with the development of the “online world” as well as our cultural shift towards digital entertainment. For the most part, storytellers and novelist everywhere have done a phenomenal job with creating lifelike and relatable adventures for us to enjoy from afar, taking solace in the knowledge that our only job is to continue reading. But, what would happen if that was not our only job? What happens if your failure to act in some way lead to the death of your favorite character? Imagine. A story that changes based on choices with limitless outcomes that your must pick in order for it to progress. Take that a step further. Throw in several thousand other readers whose decisions carry equal weight alongside your own. You are faced with problems that you cannot solve without their help. Even you choose not to act, that still impacts the narrative, even without your knowledge. It becomes difficult to differentiate between reality and fantasy doesn’t it? Stories like this are currently in existence and have been for a number of years under the title of an Alternate Reality Game or ARG for short. An ARG is a form of digital or transmedia storytelling that is largely interactive with the readers or “players.” ARGs tend to be somewhat consuming, blurring the lines between both reality and fantasy by attempting to convince players that “This is not a game,” a term coined and abbreviated “TINAG.” Many people tend to think that the TINAG is something that is something that is morally questionable, as it purposely misleads the players, yet at the same time something that is necessary for gameplay, as most books or video games do not “break the fourth wall” so to speak. As all of this is such a complex concept, it is completely understandable to wonder, “Who exactly came up with this massively complex and deep story structure?” In order to answer that question, one must look back a full twelve years to the work of such names as The Cloudmakers, The Puppeteers, and Haley Joel Osment. The year is 2001 and A.I. Artificial Intelligence is the year’s most anticipated Sci-fi film. Steven Spielburg fans watched in eager expectation while the trailer film predicted a deep plot with never before seen special effects. For the average viewer, the trailer was satisfying in and of itself. However, to those that had a more careful eye, the credits contained a small piece of shocking information that, in later years, became known as the entry point or “rabbit hole” (term taken from Alice and Wonderland) that started the world’s first ARG. This “rabbit hole” took the form of a young woman by the name of Jeanine Salla who was employed by Warner Bros. as…. a Sentient Machine Therapist? Miss Salla was listed alongside other such credits as “Costume Designer” and “Executive Producers”, and therefore was difficult to pick out of the crowd., save a small flash across her name and her peculiar job. (The trailer can be seen here. Jeanine Salla’s name is shown between 1:13 and 1:15). Those curious enough to investigate could simply Google Search Jeanine’s name and read her biography at her workplace of Bangalore World University. For the players committed enough to find what exactly a Machine Therapist was, Jeanine’s phone number was included and if called revealed a voice message claiming that her family friend Evan Chan was recently deceased on his A.I. enhanced boat, The Cloudmaker. At this point, there was a sizable audience that was unsatisfied with the story of Evan’s death (according to his bio, he was a superb swimmer and was within swimming distance of land when his boat crashed. A second rabbit hole was revealed about this time as well. 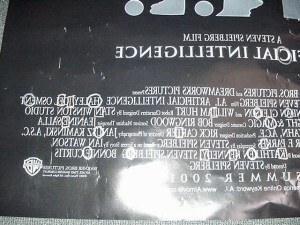 On the reverse side of the A.I. movie posters was a strange code that when deciphered read “Evan Chan was murdered.” and “Jeanine was the key.” As if that wasn’t enough to hook in a massive and dedicated audience. The rest of the ARG consisted of the players (self dubbed the “Cloudmakers” in memory of Evan’s boat) investigating Evan’s death and exploring the unknown “fantasy world” including two opposing groups; “The Anti-Robot Militia” and the opposing group “The Coalition for Robot Freedom” as well as many real world locations and even real phone conversations with responsive game characters. The game ended pretty anti-climatically with the announcement that new legislation had been passed to recognize the equal rights of robots. The creators also formally ended the game and broke today’s unspoken TINAG law with an email thanking them for participating, something that was not incorporated into most ARGs today as it causes any blurring between the lines of reality and fantasy to be redrawn. (Other accounts of the narratives plots can be found here and here). One must really hand it to the designers of the ARG (dubbed The Puppeteers) for their programatic decision to make the ARG as they went. 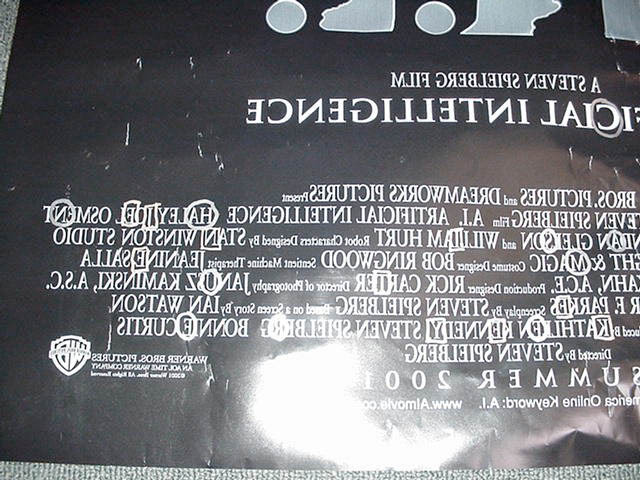 Since they were directing the hidden gameplay as the players were making discoveries, this allowed for personalized puzzles for prominent game players and even making somewhat threatening calls to those who agreed to submit their telephone numbers under the guise of the ARG’s antagonists (imagine several other designers giggling in the background of the call). In other words, the game was being created while the players were playing it. Their choice to keep the ARG fluid instead of planning out every last detail allowed for one of the trademarks of ARGs today: community problem solving in order to accomplish a shared goal. Players (still unaware that they were players at this point) were forced to work together to solve an elaborate and extremely difficult set of riddles, detective work and logic problems. One of the designers of the game, Jordan Weisman, claimed that there was “no puzzle would be too hard, no clue too obscure, because with so many people collaborating online, the players would have access to every conceivable skill set.” And he was right. 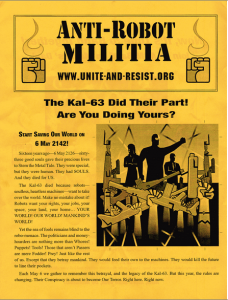 The riddles that the online players solved ranged from a puzzle that required a working knowledge of lute tablature to players in New York, Chicago and Los Angeles attending Anti-Robot Militia rallies (an account of the rally can be read here). “Not only do they have every skill on the planet,” he says, “they have unlimited resources, unlimited time, andunlimited money. Not only can they solve anything, they can solve anything instantly.” Weisman created an invaluable trend, by forcing players to cooperatively solve problems, that opened worlds of possibilities for what ARGs in the future. Overall, “The Beast” has done more for Alternate Reality Games than anything else in their history and its influence is still prominent in today’s ARGs. While it is true that there are other ARG-like cases that appeared around the same time, they cannot compare to the breadth, depth and creativity that this ARG had. Over 3 million players coming from all different ages and backgrounds all joined forces in the short span of only 3 months. Not only did the designers of this game introduce the concept of the ARG to the world, but they did it all from scratch. These guys had no example to follow and were left to their own imaginations to rely on. Perhaps the most important, since the game was so popular and consuming, even after its conclusion people wanted more. Fans were galvanized into creating ARGs of their own using “the Beast’s” template and increasing on this new genre in gaming, but always staying true to the staples; community problem solving, the “this is not a game” sentiment and real life actions to influence the narrative. A few examples of the second generation ARG material influenced from The Beast include: Perplex City, the ARGN network, and even 42 Entertainment displays heavy influence. It truly is impossible to understate the importance of this game in the world of Alternate Reality Gaming. 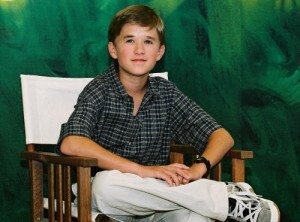 And for that we can thank the brave work of the Puppeteers, the Cloudmakers and, of course, Mr. Haley Joel Osment.